This section of the British Isles Prehistory Archive is based on the research of Graham Mullan & Linda Wilson, of the University of Bristol Spelaeological Society. 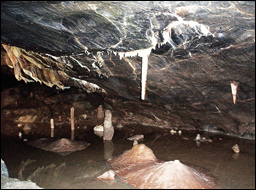 They have spent several years minutely examining and mapping numerous caves in the Mendip Hills. 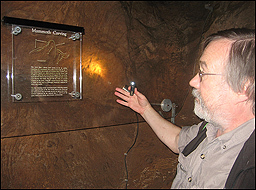 This section will focus on their discoveries within three caves in particular; Gough's Cave, Aveline's Hole and Long Hole. Cro-Magnons - the first anatomically modern humans - are believed to have arrived in Europe about 40,000 years ago. Evidence of occupation in the British Isles can be found with the skeletal remains of the 'Red Lady of Paviland' dated to 29,000 years ago, belonging to the Aurignacian culture. 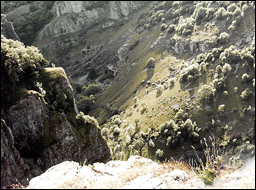 During the following Ice Age, known as the Last Glacial Maximum (LGM)) around 20,000 years ago, Northern Europe may have been completely depopulated of humans. Humans probably returned to the region now known as the British Isles approximately 15,000 years ago as the ice retreated, initially as bands of hunter-gatherer communities during the summer months. The Mendip Hills - a range of limestone hills to the south of Bristol and Bath in Somerset - have numerous recorded prehistoric sites; Palaeolithic, Mesolithic, Neolithic, Iron Age, and Bronze Age. The Cheddar Man, Britain's oldest complete skeleton, was found in Gough's Cave, part of the Cheddar Complex. This section is based on two articles authored by Graham Mullan & Linda Wilson [#44 & #49] appearing in the International Newsletter on Rock Art - INORA, edited by Dr Jean Clottes under the auspices of Comite International d'Art Rupestre [CAR - ICOMOS], Union Internationale des Sciences Prehistoriques - Protohistoriques [UISPP] and Association pour le Rayonnement de l'Art Parietal Europeen [ARAPE].